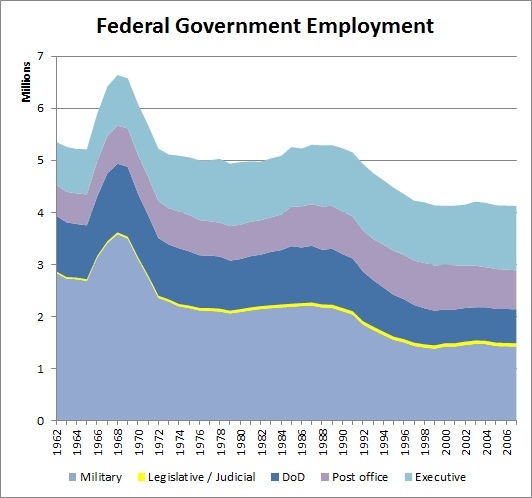 The other day I talked about how federal government and government employment in general has been on the decline recently. I showed the trend for federal, state and local government jobs from the BLS data. 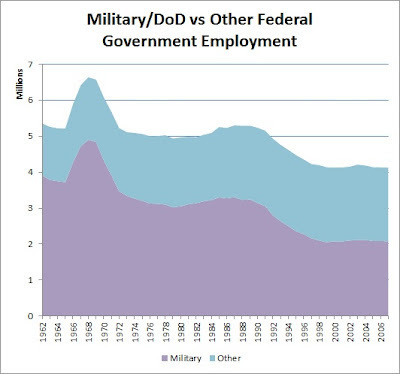 At the time I wasn't sure how much of the federal government employees were related to the military. I figured at least some were given the big jumps in employment around the 40's and 60's. 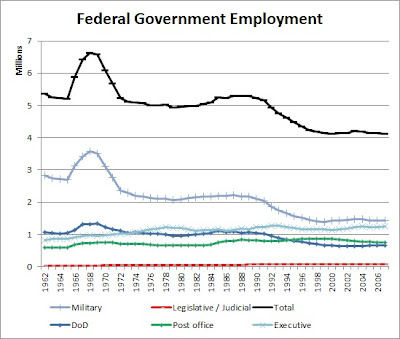 I found numbers for federal government employees broken down into some categories. The more recent budgets only show numbers starting in 1981. The 2009 budget figures have the data going back to 1962. I wanted a longer history so I am using the 2009 budget data. The 'Military' section is for uniformed military while the 'DoD' is for civilian employment within the Dept. of Defense. As you can see there the size of our uniformed military is mostly the cause of decrease in total federal employment. The other lines generally trend flat over the decades (more or less). I'll also point out that from 1962 to 2007 the population of the U.S. increased about 60% from around about 189M to 304M. This graph more clearly illustrates the impact that total military related employment has had on the general trend in federal government employee total. Those numbers are in thousands.